A few years ago Ben and I were talking and Mrs. Doubtfire somehow came up in our conversation. I was amazed to learn that Ben did not own this movie. He loves Robin Williams, and I always thought it was one of his best family friendly comedies. Ben then responded, “I hate that movie,” which seemed even more perplexing. How could anyone hate Mrs. Doubtfire? Turns out this film was released around the time Ben’s parents were divorcing, and he had a strong memory of crying in the theater while watching it. Suddenly his dislike for this movie became very obvious, and I felt like a jerk for not putting two and two together sooner. It’s strange, but I had kind of forgotten that Mrs. Doubtfire is about divorce. I’ve not seen the movie all the way through since I was a kid. All of my memories of it involve Robin Williams dancing with a vacuum cleaner and smashing a pie into his face. I suppose if I was pushed to explain the plot I would have remembered that the Williams is pretending to be a female British nanny in order to spend time with his children, but I honestly never gave it that much thought. I am fortunate that divorce has not affected my life in any significant way. To me, this is just a silly movie about a cross-dressing man, but I totally get that this would be depressing to watch if you were a kid (or adult) actually going through a similar situation. While in many ways this is still a very silly movie, I can appreciate the serious side of the story as an adult. I can imagine that most parents would do whatever was necessary to remain in their children’s lives after a divorce. The emotions displayed by Williams and Sally Field, who plays his ex-wife, feel incredibly real and add to the raw emotion of the situation. I felt that the film makes it clear that they are both to blame for the divorce, and are both failing their children in different ways. It’s clear by the end that both Mom and Dad are learning to be better parents, and figuring out how to co-parent in a way that puts the kids’ needs first. (If only every split were this amicable, right?) I also appreciated that the parents don’t get back together in the end. It’s a nice bit of realism in what is otherwise a rather unrealistic story. Robin Williams of course steals the show, as he did in just about every project he was a part of. He has some great moments of ad-libbing, but also excels in the scripted portions of the story. It’s amazing how he so perfectly embodies his self-created alter ego (even if I don’t believe that he’d actually be able to fool his ex-wife or children). Williams also knows exactly how to play each scene, bringing heartbreaking seriousness to the scenes that need them. This was the second of two films that Sally and I decided to watch early after Robin Williams died suddenly on August 11 2014. 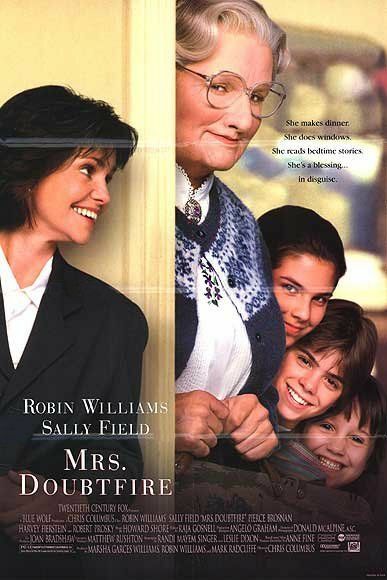 While the first film, Hook, was a bittersweet film for me to watch because I had really enjoyed it growing up, Mrs Doubtfire was a film that never really grabbed me as a child. The story focuses on divorce and it was released at the same time my own parents were splitting up. This movie was far too real for a child going through divorce to deal with, I remember crying when I watched it the first time in theatres with my father. Watching it again, when my parent’s divorce is not so raw, I can definitely appreciate the comedy more than I used to, but it still brings back more memories than I’d like to remember. Williams plays Daniel Hillard, a perpetually out of work voice actor married to a workaholic architect, Miranda (Sally Field), with three kids, Lydia (Lisa Jakub), Chris (Matthew Lawrence) and Natalie (Mara Wilson). To celebrate his son’s birthday, Daniel organises a large party, going against the wishes of his wife. When she returns to find the home a huge mess, it is the final straw for their marriage and she announces she wants a divorce. After a brief time of separation, Miranda decides she needs a nanny and advertises for one. Daniel sees this as an opportunity to spend some more time with his kids as he has only been allowed supervised visitation rights by the divorce court. Daniel transforms himself into an old woman, perfect for the role of housekeeper in the Hillard household. Can Daniel keep up the charade long enough to win his kids back or will it all blow up in his face eventually? One of the things I like about this film is that it is realistic. There is never any talk of Daniel wanting to win back his wife. This story could so easily have fallen into that romantic comedy trap as Robin Williams attempted to help his wife remember what she loved about him and get back together. Daniel’s motivation is only to see his children. This was a more realistic scenario as a lot of marriages fail and this movie reflects that really well. I am sure there would have been studio pressure to have the extra happy ending, but the fact the resisted this makes the film seem more real. Which is saying something when the plot involves a middle aged man man cross-dressing as an old Scottish woman. As with most Robin Williams films, his ad-libbing is the highlight here. The man is able to turn it up to 11 whenever he needs too, and does it with great effect throughout the film. His scenes as Mrs Doubtfire are hilarious at times. I can’t imagine how difficult it must have been for the young cast to keep a straight face, let alone the more experienced actors like Sally Field. The movie is very funny, and I’m sure if it didn’t hit quite so close to home, I’d have enjoyed it so much more.